1. 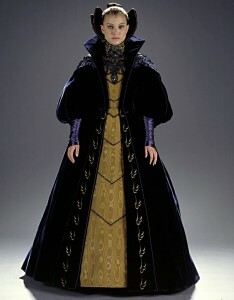 Fitted floor-length A-line undergown of a gold moiré or watered silk or silk-like fabric with a tall fitted collar. The skirt of the gown should have structure (hoop skirt preferred). The gown has an elaborate jeweled decoration of navy and jet beads/rhinestones covering the collar and breast as well as decorative beaded chevron lines down the front of the gown to just below the knees. 2. Fitted floor-length surcoat of a dark navy or dark purple velvet with a high structured whisk collar/lapels and leg o’ mutton sleeves. The upper sleeves are in velvet and should have structure to fill out the puffs with the lower sleeves in a fitted, gathered navy or purple satin ending below the wrists. The front edges of the gown are decorated with a gold leaf design from the waist to the hem. 3. Two navy or purple crinkled satin scarves with fringe are attached to the collar beneath the lapels and are over the shoulders and down the back, ending several inches above the coat hem and are gathered at waist-level by a satin band decorated with strands of navy and jet beads. 5. Hair is pulled back from the face, gathered into two fans of hair on either side of the head and two smaller fans of hair just below the crown of the head. Decorative brooch of purple stones/drops attached to the center front of the hairline. Naturally occurring hair colors only; no bangs.